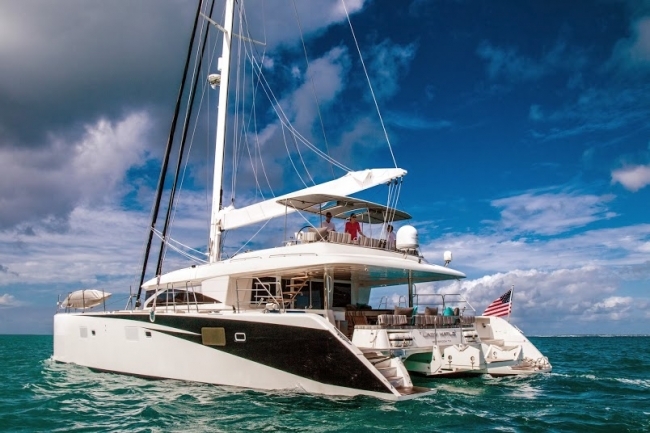 Lady Katlo is offering 15% OFF any charter booked to take place and end before Nov. 5, 2015. Grenadines location June thru mid October 2015. Virgin Islands location from late October to November 5, 2015. Valid for charters of 4 nights or longer, charters less than 6 nights apply standard surcharge. This offer may not be combined with any other offer. Lady Katlo, a 2010 Lagoon 620, was refurbished in a 6-week refit in late 2013. She is the very spacious luxury owner's version with galley down and 3 guest cabins. Lady Katlo offers many unexpected extras to make for an extremely comfortable cruise. The Master Suite has a walk around queen bed (65"W X 80"L) and private lounge area. All Staterooms have en-suite head with electric toilets and separate shower stalls and one Play Station 3 game console, one per cabin. The crew have a separate companionway and facilities. Fully air conditioned throughout.